"This recession cannot have my wedding!" Affordable Florida Wedding Services Are Here! 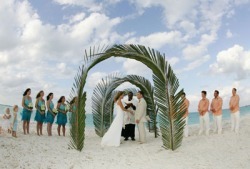 You have always imagined that you would have the beautiful wedding of your dreams. You imagined rose petals floating down from the cathedral vaulted ceiling, the tingling of champagne glasses, a white lacy bride’s dress with a train a mile long. Now that it's time to start putting your wedding together, the headlines and your bank account report that the days of big spending are over. Instead of focusing on how much money you have, focus all your attention on how you can create the beautiful beach wedding you desire. We can help.